KATHMANDU, April 28: The Saving habits of Nepalis is expected to improve significantly in the current fiscal year, indicating that people are investing more than they used to about two and half decades ago. Nepalis are expected to save Rs 15.01 out of Rs 100 worth of goods and services produced in the country in the current fiscal year FY2017/18 - a record high since FY1994/1995, shows a preliminary estimate of the national accounts made public by the Central Bureau of Statistics (CBS) on Wednesday. This means only Rs 84.99 out of every Rs 100 worth of goods and services produced in the country will be consumed in the current fiscal year. According to the CBS, the country’s economy is projected to grow by 5.89 percent to a little over Rs 3 trillion and the expected value of savings is in tune of Rs 450 billion. This saving may be in different forms i.e. in banks or in different forms of investments. Likewise, the preliminary estimate shows that more share of GDP will go into capital formation in the fiscal year. The estimates show that 34.11 percent of GDP, or Rs 1032 billion, is expected to be invested to develop hydropower projects, and build roads and other infrastructure projects. In the past fiscal year, such share was only 31.81 percent of GDP. 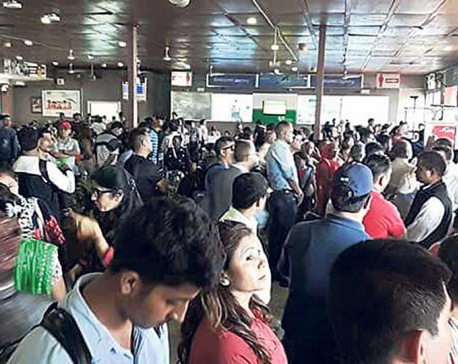 Jishnu Mohan Bhattarai, a director of CBS, explained that the consumption by Nepalis has slowed down in proportion to generation of goods and services in the year. “As more share of GDP will go into capital formation, it will drive the economy further in the new fiscal year,” he added. Both indicators bode well for the country’s economy which saw a near zero growth in FY2015/16 due to 2015 earthquakes and 20-week supply disruption due to Indian blockade. 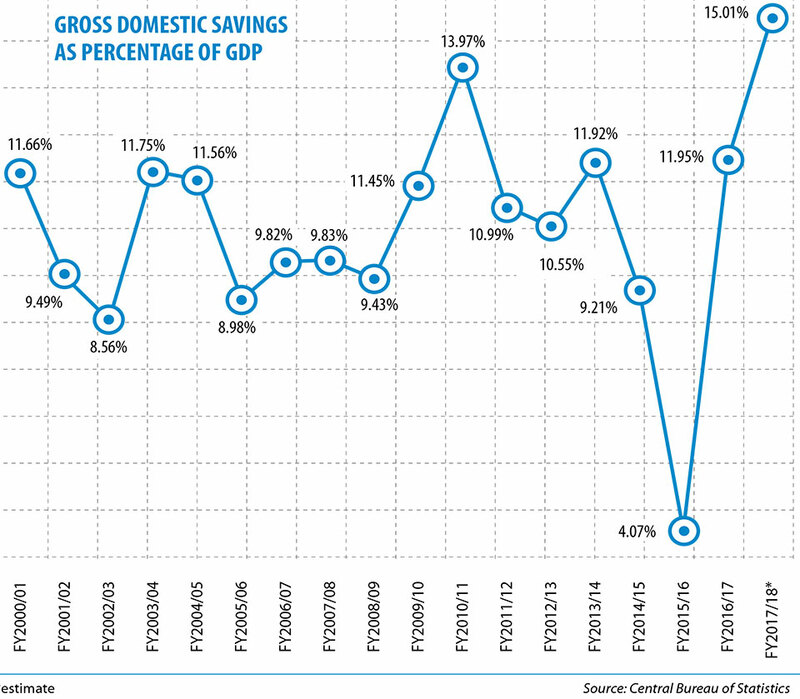 During the fiscal year, such saving, which was at 4.07 percent, was the lowest in the past two decades. However, capital formation had seen a minor increment of a little over 1 percent to 28.73 percent of GDP. These two indicators have made economists and statisticians upbeat about the performance of economy in the coming fiscal year as well, as investments from saving will accelerate the economy to a new height. “We are hopeful about better economic prospects in the next fiscal year as well. I think the growth will be near 7 percent in next fiscal year,” added Bhattarai. Rameshore Khanal, a former finance secretary, said: “The preliminary estimates show that domestic savings and gross capital formation has increased. It will help to accelerate economic growth in the coming years.” He expects the growth rate to hover above 6 percent in the next fiscal year because mining, tourism, manufacturing and electricity sectors will continue to grow at a higher rate next year as well. “As share of agriculture is going down, even a bad weather will not dampen the growth,” added Khanal. The economic growth of 7.39 percent recorded in FY2016/17 is the highest in the past two decades mainly due to a low base of near zero growth because of the damages by the 2015 earthquakes and subsequent Indian blockade.